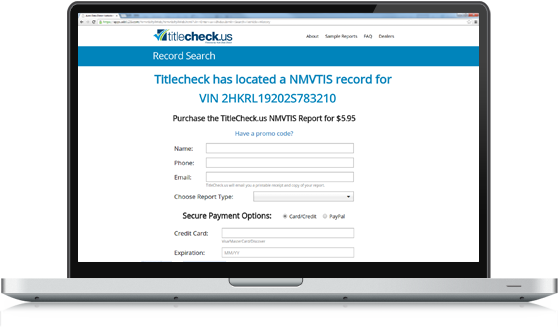 Search federal vehicle title, salvage and total loss information quickly and affordably with National Motor Vehicle Title Information System (NMVTIS) title check reports from Auto Data Direct. Enter a VIN below to get started. Don't get stuck with a rebuilt wreck, get a federal title check. NMVTIS title data includes current state of title and date of issue, previous titles reported by jurisdictions, and odometer readings recorded when the titles were issued. NMVTIS title data includes title brands (labels such as "Junk" or "Flood") applied by states that can affect the value of a vehicle. When a vehicle is reported as a total loss by an insurance company, generally the vehicle has suffered severe damage. A vehicle with an NMVTIS salvage history has been handled by a salvage auction, auto parts recycler, rebuilder or other salvage-related business. Start your used car search with a low-cost title check report from Auto Data Direct. All you need is the vehicle identification number (VIN) to get started. We make it easy. No sign up, subscription or recurring fees. Send a copy of the report to yourself or share a copy with a friend. At only $9.95 each, reports are an inexpensive first step in your used-vehicle research. Purchase reports with credit card, debit card or through PayPal. Auto Data Direct reports contain federal vehicle information designed to protect consumers from fraud and unsafe vehicles. Created by federal law in 1992, the National Motor Vehicle Title Information System (NMVTIS) is the only publicly available system that requires state DMVs, insurance carries, salvage yards and other businesses that handle severely damaged automobiles to feed title information into a centralized database. NMVTIS allows a vehicle's title history, odometer readings and salvage records to be verified by states and potential buyers. 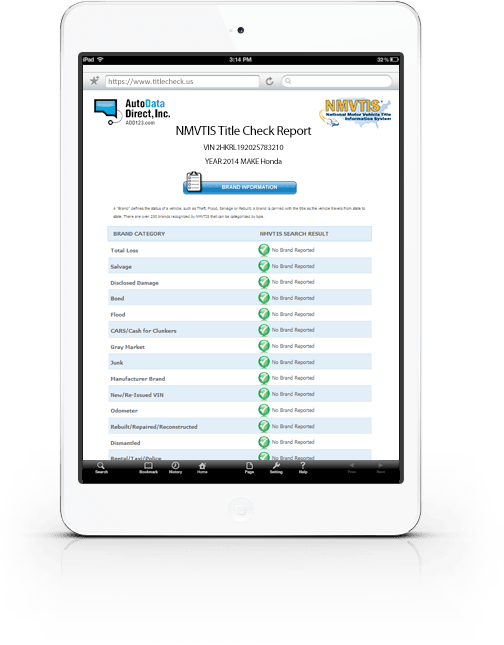 A NMVTIS report can alert states to fraudulent activities such as VIN cloning or title washing, and can tip you off to potential title issues before you're standing in line at the DMV. While the NMVTIS database does not include owner names, records on minor accidents, repair histories or recall information, it can warn you that a title brand, total loss or salvage history may make the car unsafe. Always make sure you obtain an independent vehicle inspection before you buy any used vehicle.